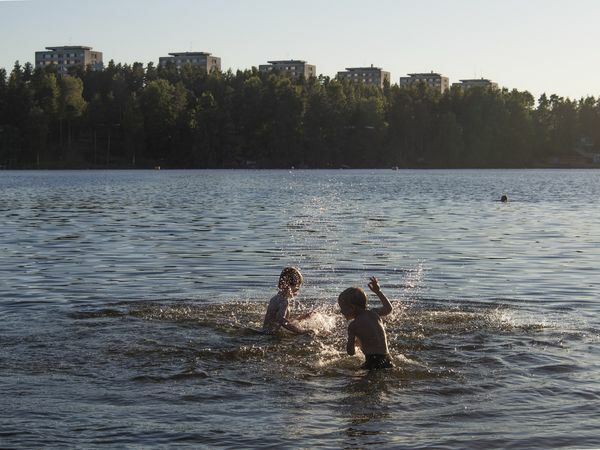 Lahti’s water bodies are now in significantly better condition than they were few decades ago, thanks to active water protection and restoration projects. Of all the large cities in Finland, Lahti is the only one located on a large groundwater area, making it vital to be active in protecting these resources. The moraine ridge underneath the city is an important area for recharging groundwater. Groundwater is a valuable asset and is used by local brewers and in distilling companies in highly refined products. Groundwater is also utilised in cooling premises and as a cold energy resource in growing urban districts. A regional groundwater conservation programme has been drawn up to protect and further improve the quality of groundwater. Started in 2012, the groundwater protection plan aims to improve the chemical condition of the groundwater. Groundwater is used as a source of drinking water and needs only minimal treatment due to its natural good condition. The quality is monitored carefully and the water is supplied to approx. 140,000 residents by City-owned water company Lahti Aqua Oy. Several environmentally friendly biocleaning methods are used to improve the groundwater quality, such as chemical additives to prevent bacterial growth and corrosion of pipelines and UV purification systems in water towers. An environmental counselling unit actively advises residents in all matter related to household wastewater management. Supporting sustainable water use amongst residents from a young age, those who are interested can participate in the “Biggest Loser” competition or test their skills on the “Water School” website, aimed at kids. All actions to reduce the water consumption entail better awareness of the environmental problems we are facing.